It's day six of President Trump's first foreign trip, and he'll be spending it in Brussels where he'll meet with a series of European leaders and participate in Thursday's NATO summit before returning to Italy later this evening. Live updates per White House pool reports. 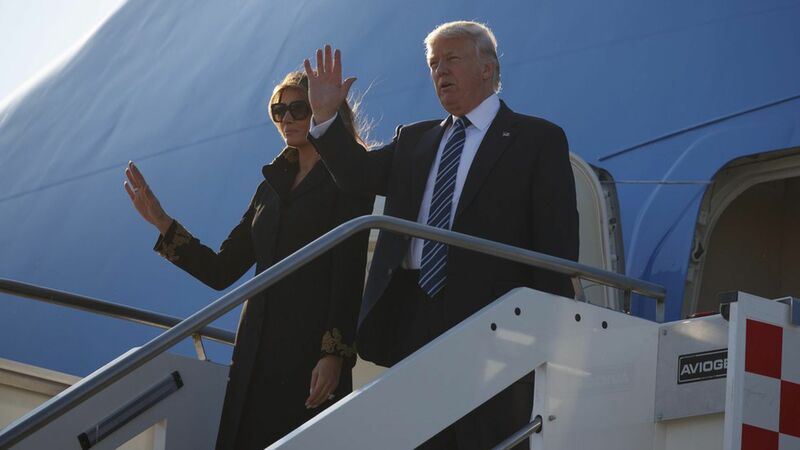 The latest: Trump's arrived for the night in Sicily. What is NATO Article V and where does Trump stand on it? Trump to Macron: "You were my guy"
4:06am ET/ 10:06am GMT+2: President Trump departed the U.S. Ambassador to Belgium's Residence en route to the European Union Headquarters for a bilateral meeting with EU President Donald Tusk and European commission President Jean-Claude Juncker. He rode in the Beast, the president's armored Cadillac limousine, which carried the American and Belgian flags. The poolers note that there was a heavy security presence on the streets: the city was largely empty, large trucks blocked many intersections and scores of armed police lined the route. 5am ET/ 11am GMT+2: Trump, President Tusk, and President Juncker held a meeting at the newly-completed EU Headquarters, known as Europa. The two leaders sat across from each other at the center of a long, rectangular table. The conference room had EU and US flags along the wall, and small flower arrangements at the center of the table. Trump then told the leaders about his foreign trip. "I started in Saudi Arabia. We covered a lot of countries, a lot of leaders. Some great meetings in Saudi Arabia... It was very spectacular. I don't think there was ever anything like that. That was beyond anything anyone's seen. We went to the Pope. Very impressive. The Pope was terrific." 5:30am ET/ 11:30am GMT+2: Trump departed EU headquarters and arrived back the U.S. Ambassador's residence at 11:38am. 7:12am ET/ 1:12pm GMT+2: French President Emmanuel Macron arrived at the US Ambassador's residence, where he was greeted outside by Trump and Melania. Trump shook hands with Macron, who he was meeting for the first time, and asked, "How are you?" before the three went inside. 7:20am ET/ 1:20pm GMT+2: Before sitting down for a one-on-one meeting, President Trump and French President Macron delivered brief remarks. "It is my great honor to be with the newly elected president of France, who ran an incredible campaign and had a tremendous victory. All over the world they're talking about it. And we have a lot to discuss, including terrorism and other things. Congratulations. Great job," said Trump. Macron replied, "For my part, I'm also very happy to be with President Trump. We have an extremely large agenda to discuss: the fight against terrorism, the economy, climate and energy." The pooler notes that the two leaders then shook hands for an extended period of time. "Each president gripped the other's hand with considerable intensity, their knuckles turning white and their jaws clenching and faces tightening." 8:58am ET/ 2:58pm GMT+2: Melania tweets her thanks to the Queen Fabiola University Hospital in Brussels, where she did arts and crafts with the patients. 10:15am ET/ 4:15pm GMT+2: Trump arrived at the NATO headquarters in Brussels. He will soon deliver remarks at the unveiling of Article 5 and Berlin Wall memorials. "The recent attack on Manchester and the United Kingdom demonstrates the depths of the evil we face with terrorism... it was a barbaric and viscous attack upon our civilization... all people who cherish life must unite in finding, exposing and removing these killers and extremists, and yes losers. They are losers... The NATO of the future must include a great focus on terrorism, and immigrations... these grave security concerns are the same reason I have been very very direct with Secretary Jens Stoltenberg and members of the alliance in saying NATO members must finally contribute their fair share and meet their financial obligations." 10:55am ET/ 4:55pm GMT+2: Trump participated in outdoor ceremony to mark the transfer of NATO's new headquarters building from the Belgian government to NATO. Trump was seated in the front now, next to Belgian King Philippe, NATO Secretary General Jens Stoltenberg, and Prime Minister Theresa May (who he leaned over to speak with several times). 11:05am ET/ 5:05pm GMT+2: CNBC's Steve Kopack tweets a video of Trump shimmying his way to the front of a group of NATO members. 11:45am ET/ 5:45pm GMT+2: President Trump attended a working dinner in Brussels with NATO leaders at 5:45pm. WH Press Secretary Sean Spicer delivered a brief summary of the dinner to reporters. "Right off the bat, there was unanimous support for a resolution to commit to burden sharing and combatting terrorism, which are two things the president talked about during his campaign and now as president." said Spicer. He added that Secretary General Stoltenberg also gave a presentation, using "a big chart" to show how burden sharing was negative and has become more positive. "It was a very positive reaction and affirmation of the president's priorities today.